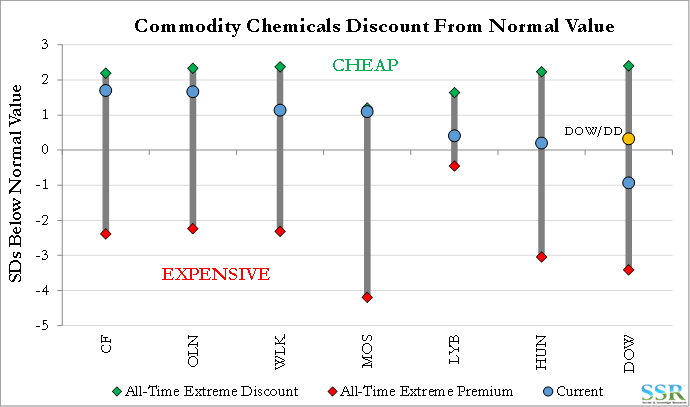 Despite a very strong last six months most commodity chemical names do not look expensive versus prior peak valuations and currently product pricing is recovering quickly in many areas. The recent rally is far from impressive based on historical swings. Ethylene/polyethylene is more “stable” at high levels rather than rising. Everything else has a steep upward slope today. DOW only looks inexpensive if we apply a share of the expected deal synergies, but even without these DOW still has upside to prior peak valuations – albeit more limited. 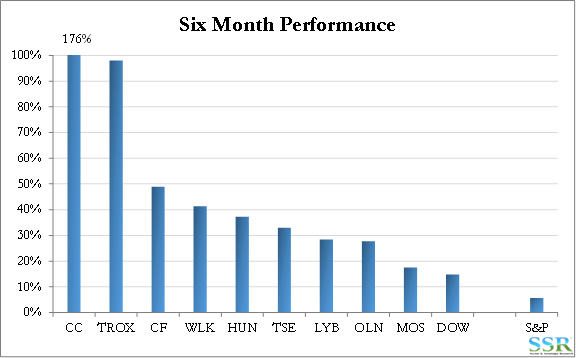 The greatest upside is at CF/MOS with OLN/WLK not far behind. In Exhibit 1 we show the swings and roundabouts for each of the commodity lines that matter for the US stocks – interestingly Styrenics (TSE most exposed) has fewest road blocks and TSE may be the better risk/return play as a result. Investors are fixated with ethylene capacity additions in the US despite global additions not really running ahead of demand. 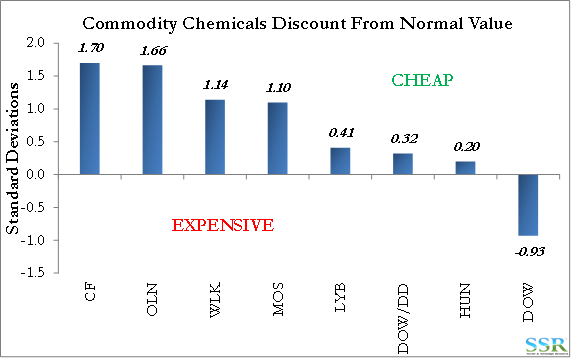 If ethylene/polyethylene can simply maintain its current level of profitability the exposed stocks remain cheap. A dividend increase last week from WLK affirms the strong cash flows and the ability of the group to return cash to shareholders – LYB remains our top pick. Segments exposed to China’s continued discipline with regard to coal based production and air pollution are also those where US trade action could help – so maybe these offset. If China starts losing discipline and dumping – expect a trade response from the US. On this basis, all of the TiO2, PVC/Caustic and Urea names have material upside. Most interested in HUN because a successful spin out of the TiO2 business (in a rising TiO2 market) could result in a sale of the residual company – “Rockwood Take 2”. Commodity rallies like we are seeing seldom run out of legs in the first quarter of any year, and by historical standards this is not much of a rally yet. Investors are waiting to see whether the demand pull – or other cause of market tightness – is real and sustainable and can drive price rises through the year. We would be surprised if this rally ended before April and it could be sustained through the rest of the year. Only Dow has reported thus far, but was very positive on polyethylene and PVC/caustic. In Europe we would look at Akzo because of the Chloralkali exposure. All of this probably looks very good for Ineos and its debt. The commodity chemical companies have enjoyed a very strong last 4 months, with our “later in 2016 could provide a better entry point” thesis of this time last year showing that sometimes it is better to be lucky. We had not contemplated the cut back in China coal production and the actions to curb pollution at the time and absent that trigger it is likely that economic weakness would have had the upper hand. The exception in our view was always polyethylene, in part because of strong growth but also because the China coal story is far less relevant here and China remains a large net importer. Cutbacks in China are driving incremental strength in ethylene/polyethylene around the world, but meaningful changes in market dynamics for PVC/Caustic, Urea and TiO2. Outside chemicals the China cutbacks are helping both steel and aluminum. In all of these cases the global oversupply has been focused in China and without Chinese exports, or with reduced exports, markets are tightening quickly. In Exhibit 2, despite the strong recent performance, the only stock that screens as expensive on our normal framework is DOW and even DOW still looks cheap if you adjust for the potential DD merger synergies (Exhibit 3). If we pick any one of the companies with a longer-term history it is very clear that we are a very long way from “peak” valuation and we show what current peak and trough valuation would look like for each company versus current pricing in Exhibit 4, again giving DOW the deal benefits. We discuss TSE, CC and TROX later in the report as we do not have the history to include them in Exhibits 3 and 4. 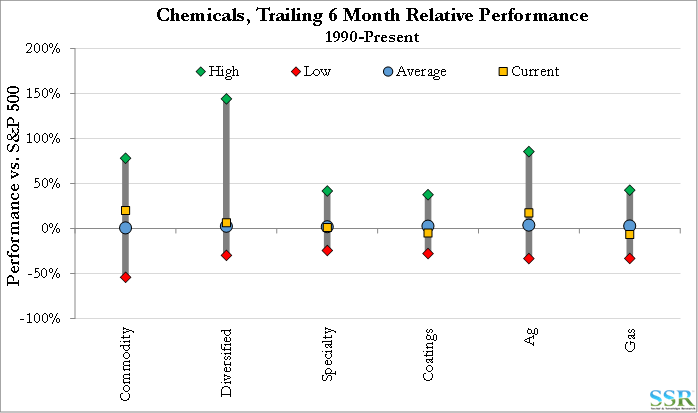 While we think that Chemicals have had a great 6 months it is worth noting that it is not really the case – Exhibit 5 – because the rally has been focused in the smaller cap commodity focused names and some of the larger cap players in coatings, industrial gases and specialties have been left behind. Our sector preference for 2017 is Metals first and Paper and Packaging second and we are agnostic on Chemicals overall. 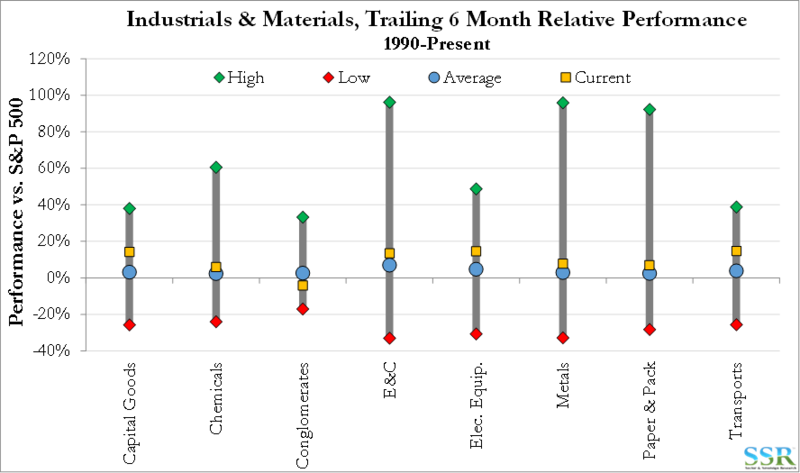 Looking at the chemical sector alone and breaking the analysis down by sector it is clear that the average performance has been held back by the Coatings and Industrial Gas sectors – Exhibit 6 – but note that the commodity rally is not that significant. In prior commodity swings the stocks have moved much more significantly on a 6-month basis. Note that out Index does not include CC, TROX and TSE because of a lack of history. Polypropylene improvement is good for LYB, but does not really impact other publicly traded names in the West – Dow sold its business to Braskem, which could be another way to play the recovery (we do not follow Braskem closely enough to have a view on valuation). Polyurethane improvements are good for LYB, DOW, HUN as well as BASF and Covestro in Europe. Polyester is largely in the hands of Asian and Latam companies today, though EMN still has some specialty grades, not really impacted by the China surplus. China has been a major exporter of cheap base epoxies for several years and this has impacted prices further up the value chain. Better base epoxy pricing would help HUN and OLN. If you believe in the China discipline and continued economic growth everything should work and it is the ethylene chain that has the most risk as we are adding a lot of capacity (focused in the US) and there could be some margin volatility around timing – while LYB, DOW and WLK still are far from peak, they are well off their lows. Favor: TSE, OLN, HUN, TROX (we still do not like the litigation risk at CC, but see the value). WLK still looks very inexpensive with PVC possibly offsetting the risk in ethylene. If you believe the China discipline will be short lived then the ethylene cycle looks like the better bet, despite some of the gains being behind us. Styrenics, polyurethanes look quite good regardless – LYB has the ethylene risk, HUN has the TiO2 risk – TSE looks fairly well protected. For many of the major commodity materials, the world in general has not had a material surplus of capacity – China has. In most cases these Chinese surplus – driven by massive overinvestment by too many companies too quickly and completely overshooting national self-sufficiency goals – has been so significant that the world has been swamped. As an example in 2015 theoretical global operating rates for both PVC and Caustic Soda were lower than in the mid-1980s, but isolating China the rest of the world was balanced to short. We have seen considerable rationalization in the West to accommodate Chinese surpluses in TiO2, PVC, some in the ethylene chain, and Aluminum. China’s PVC capacity grew from 32 million tons in 2009 to close to 70 million tons in 2015, effectively doubling potential global supply. The recent production reductions in China do not appear to be driven by economics (many facilities have been operating with subsidies for years, but even with higher prices they are not restarting). If this is a genuine attempt to reduce pollution, as it appears, then we may see some permanent or semi-permanent closures. On this basis we could have some very tight markets very quickly. 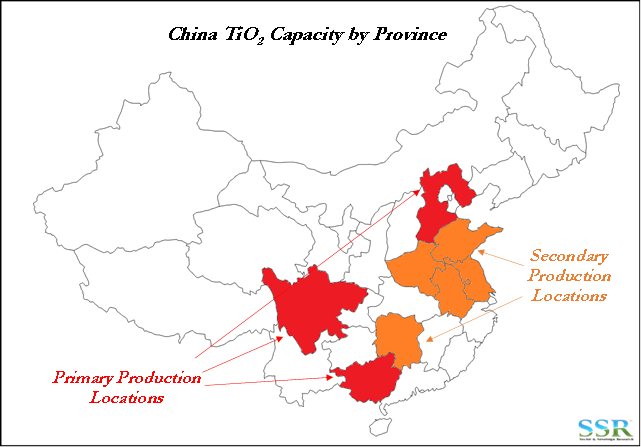 Sichuan Province is one of the most significant producers of TiO2 for example and figured heavily in the piece that wrote on China last year – and repeated here in Exhibit 7. There is some PVC production in Sichuan and a lot of Urea, but both have more significant capacity to the north east and north west of the province. TiO2 has been much more impacted by the Sichuan initiative. There are initiatives outside Sichuan also, but we highlight it here as it appears to be the most severe. There are two options for these shuttered factories in China, assuming that the government keeps its pollution focus. One is permanent closure and the other is significant investment to improve the emissions of the units. While a few plants are both large enough and modern enough to likely justify investment, many are likely not. Just as important, pricing will have to create the cash flows needed for the investment – so pricing could keep moving up. We can probably make the same claim for PVC/Caustic and Urea, but we do not have the same hard evidence of significant closures, especially for Urea which has large capacity located in the more remote north east. Current price moves would suggest that supplies are more limited for both. China’s impact on export markets, as it stood mid-2016 is summarized in Exhibit 8. The source is Bloomberg and we do not have data for all of the commodities. We would suggest that the PVC data is understated and may miss the significant movement of PVC from China to India over the last couple of years. China remains unpredictable – and we have the added wild card of how China might react to an aggressive stance on trade from the US. We do know that if China can operate profitably and meet emission requirements it will. While lower coal prices in China had been the major driver of low cost Chinese competition through the second half of 2015 and most of 2016, it is the pollution move that is driving the market today – and reduced coal production is part of that initiative. 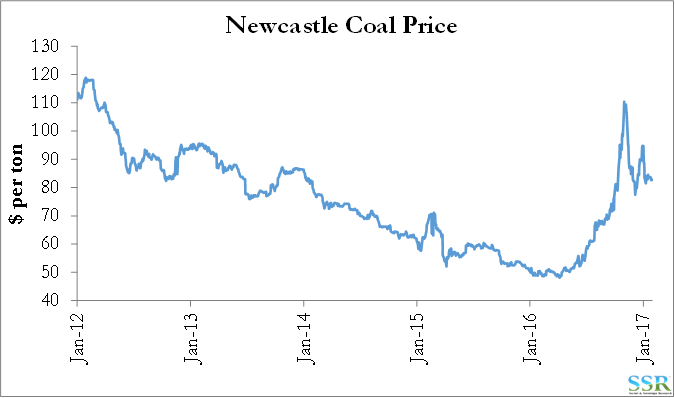 Coal inventories in China have fallen – Exhibit 9 – and prices are trending upwards – Exhibit 10 – but it is physical availability of products not the cost of manufacture that could ignite markets in 2017. What are CC and TROX worth and what is TSE worth? The problem is that we have no good history of prior peaks and what might be possible. Here are some thoughts. For Chemours: Ignoring the litigation risk for the moment, and putting Opteon to one side, DuPont made a lot of money out of TiO2 in past peaks – Exhibit 11. DD averaged operating income of $2 billion in 2011 and 2012 – the last real peak in TiO2. 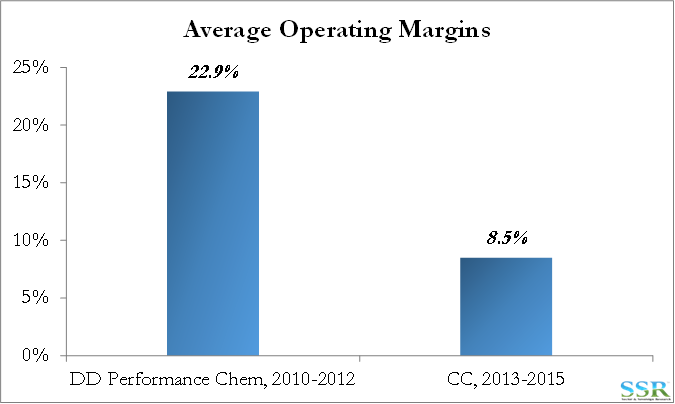 By contrast, Chemours had $200 million of operating income in 2015 versus pro-forma of $1.65 billion in 2012. 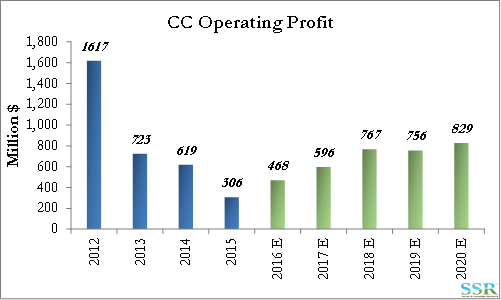 Consensus estimates for CC have EBIT reaching roughly half the 2012 levels by 2020. History shows that commodity businesses do not move in a straight line – so the expectation in Exhibit 12 is unlikely. It is more likely that a jump in TiO2 will push EBIT at CC well above a $1 billion run rate late this year. Add a tax decrease and you have $4.00-5.00 of earnings in 2018. Barring any litigation shocks (which we expect), the stock could have 50-100% upside from current levels. It a similar story for TROX, which peaked above $30 in the last TiO2 peak. Video may have killed the Radio Star, but digital media killed styrene (and polycarbonate to a lesser extent). Almost every CD, DVD, VHS tape sold all over the world was packed in polystyrene – the CDs and DVDs themselves were made from polycarbonate. Mr. Jobs and his team at Apple started a mainstream digital media migration which effectively destroyed these previously huge markets. 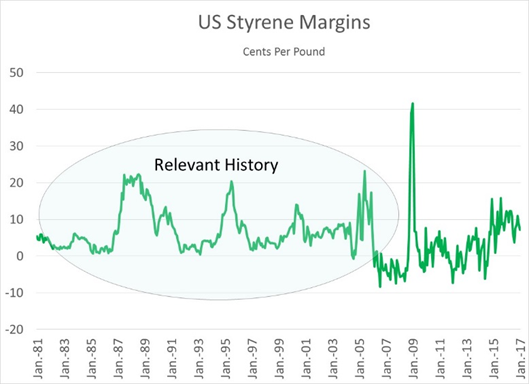 Styrene behaved like a normal commodity chemical – Exhibit 13 – until the middle of the last decade, at which point demand declined extremely quickly and a prolonged period of oversupply began – resulting in effectively zero margins, closures and consolidation. The spike in 2009 is a function of feedstock costs falling faster than styrene prices for a period of a few months following the financial crisis and subsequent recession. If we want to model what the world could look like for TSE we need focus on what a “normal” styrene market looked like – the period from 1981-2006. Here we see three cyclical peaks reaching roughly 20 cents per pound of styrene margin. Styrene has a number of derivatives that have non-like for like substitutes (for example SB Rubber and natural rubber, or polystyrene and polypropylene, or polystyrene and containerboard), so there is generally a limit to how high prices can move before demand starts to fall. Current margins are volatile but through the chain in our view around a third of peak levels. Conservatively, a bull run on styrenics could probably double TSE’s EBIT, versus the current flat projections, with earnings well above $10 per share, and perhaps as high as $12 per share. On this basis, despite the strong performance already, TSE could double in a strong commodity market, and given its lack of speedbumps – Exhibit 1 – it probably has the better risk profile also.